• How To Raise $150,000: Glenn Cecchini explains in a special report how he utilizes only 4 main revenue streams to bring in huge amount of money. 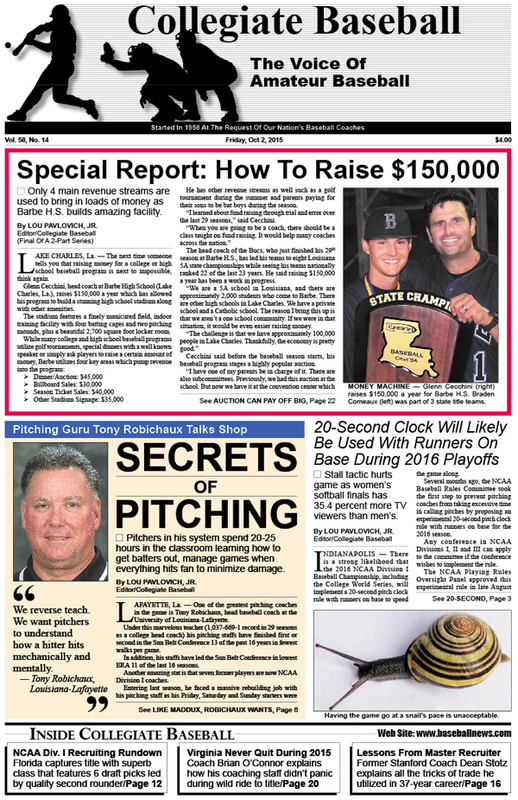 • Secrets Of Pitching: Louisiana- Lafayette Head Coach Tony Robichaux explains his remarkable system that includes 20-25 hours in the classroom for pitchers as they learn how to get batters out, manage games. • Stall Tactic Killing NCAA Baseball: 20-second clock being explored with runners on base during 2016 playoffs as women’s softball finals has 35.4 percent more TV viewers than men’s. • NCAA Div. I Recruiting Results: Florida captures title with superb class that features 6 draft picks led by quality second rounder. In-depth look at the top 20. • Special Q & A With Virginia’s Brian O’Connor: As losses and injuries mounted during 2015 season, the Cavaliers finished with the seventh best record in the Atlantic Coast Conference (15-15). Virginia’s coaching staff didn’t panic during a wild ride to the national title as O’Connor explains what they did. • Lessons From Master Recruiter: Former Stanford Coach Dean Stotz explains all the tricks of the trade he utilized in a 37-year career. • Team USA Strikes Gold: USA Baseball’s 18 and under national team wins its third consecutive world championship with a 2-1 victory over Japan. • Editorial: College World Series numbers should concern everyone in game of baseball, including worst attendance in 25 years during title game while the NCAA Women’s Softball CWS 3-game Championship Series drew 35.4 percent more viewers than the men’s over ESPN. • Rob Nelson Column: Single elimination during NCAA Division I championship would elevate tournament to a new level. • Kevin Kerins Talks Base Running: Head coach of Mercer Community College explains that aggressive base running can pay off with victories. • Jeff Messer Column: ABCA Clinic Chairman of 2016 Nashville Convention explains the top-notch speakers who have been lined up for the world’s largest baseball convention. • Charlie Greene Column: Infielders can get more repetitions with sound plan. • Ruleball With Rich Marazzi: Amazing triple play involves smorgasbord of rules. • $7.5 Million Project: TCU secures funding for major improvements with locker room, classroom, team lounge, sports medicine center, equipment room and coaches’ offices, plus a new video board. • New Products: Collegiate Baseball takes a look at a number of new products that are available from our advertisers. • High School Notes: Chapin-Newberry (S.C.) Post 193 wins American Legion title. • Special Trip To Cuba: Corban University’s baseball team makes historic trip to Cuba and has the experience of a lifetime. • Advancing With Balls In The Dirt: Al Figone explains how to train runners to be aggressive on the base paths when this happens. • Clinics Scheduled Across USA: Make your plans to attend some fabulous instructional clinics across the nation. • Art & Science Of Sports Vision: Eye placements are very different for Major League and Minor League hitters. • Tom Kovic Column: NCAA Manual features wealth of crucial information. • Being Resilient A Must: Ken Ravizza explains that bouncing back from difficult failures are vital in baseball and the military. • Hitting Instruction By Mike Epstein: Overcoaching can be a huge problem in this area of the game. • Ultimate Pickoff Move: Mike Maack’s lethal pick has caused runners nightmares for years. • Eric Cressey Commentary: Long distance running for pitchers can do much more damage than good. To purchase the Oct. 2, 2015 edition of Collegiate Baseball or subscribe, CLICK HERE.